There are so many posts floating around on how you can organise yourself and your academic material each year. However, this year I found that I wanted to do a post on this before I start uni, and most importantly before I go back to school shopping. I also want to make another post on the subject of organisation (it’s currently scheduled for the 5th of December), where I talk about how it has actually worked out this year and how I organise myself at that point. I find that the trouble with organisation systems often is that they sounds great and practical and awesome, but somewhere between back to school and Christmas they simply dissolve into chaos and you stop sticking to them. Hopefully this plan of mine will keep me from doing that, just like I managed to keep from doing last year. We’ll see in December how it went. Since I managed to stick with my system all of last year (and really the year before as well), I’m going to attempt something similar this year. I know myself quite well by now and know how I prefer to do things. Because of this I have three requirements for my system: 1) Portability, 2) Practicality, 3) Simplicity. I am one heck of a lazy girl. No joke. The reason I’m not more unhealthy than I am is that I’m too lazy to get up and go get chocolate. Therefore, for me to stick with an organisation system, it’s gotta be easy to transport. If I’d had to bring a huge bag to school to transport six binders, I’d have ditched the system within the first week. Because of this, I chose to have one ring binder that I brought with me to school every day where the newest material in all of my subjects was compiled. 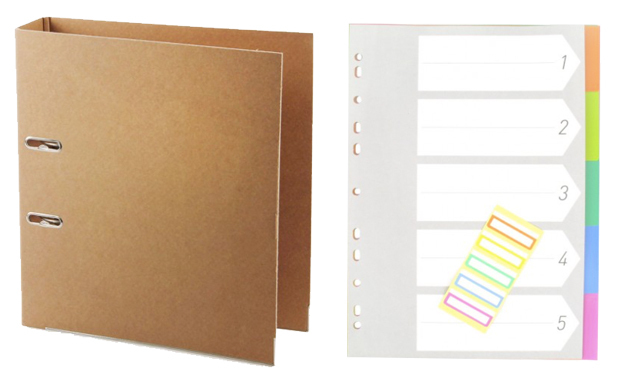 I had one divider for each subject, a clear pocket to slip any non-punched paper into and a notebook to take notes in. After I’d finished a set of notes, I’d pull them out of the notebook and put them in the binder. Then every few weeks, or after I’d had a test, I’d take all material for a subject out of the binder and put it in the home-binder for that subject. Originally I had one huge binder at home where I put everything. However, when that was full before my first year of the IB was finished, I decided it was time to change. From then on I had one binder per subject that I kept at home. In here I also had dividers, although these either divided up the content by chapter, or by type (notes, handouts, tests, essays etc). I prefer binders to folders for storage because I like to be able to turn pages. And binders can hold and awful lot. I just really like binders. Also, they’re not too hard to store if you do it correctly. I knew that I couldn’t have a too fiddly system, because then I wouldn’t keep up with it. It would be too much work. 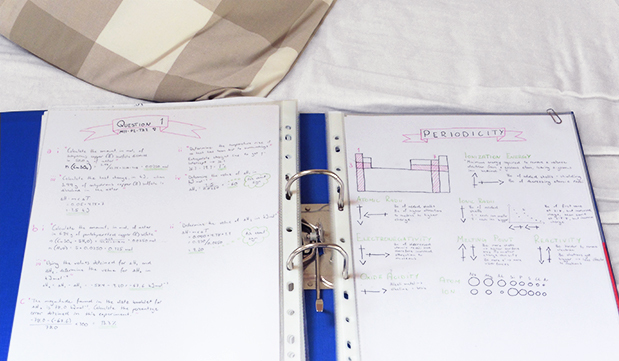 I didn’t colour coordinate binders and notebooks and highlighters. I wasn’t fussy about changes made to my note taking system. The colours of the dividers didn’t matter. It was very straight forward. Take notes, stick them in the binder, eventually stick it in the home binder. That was what worked for me. And that’s it! It really is as simple as that. If you would like to see a post on how I organise myself electronically or in my planner, or how I organise my notes, leave me a comment and I’ll get on it!